Hiking the Flatirons near Boulder, Colorado is a must. The trail draws you across an green meadow, then up through a notch between the First and Second Flatiron. 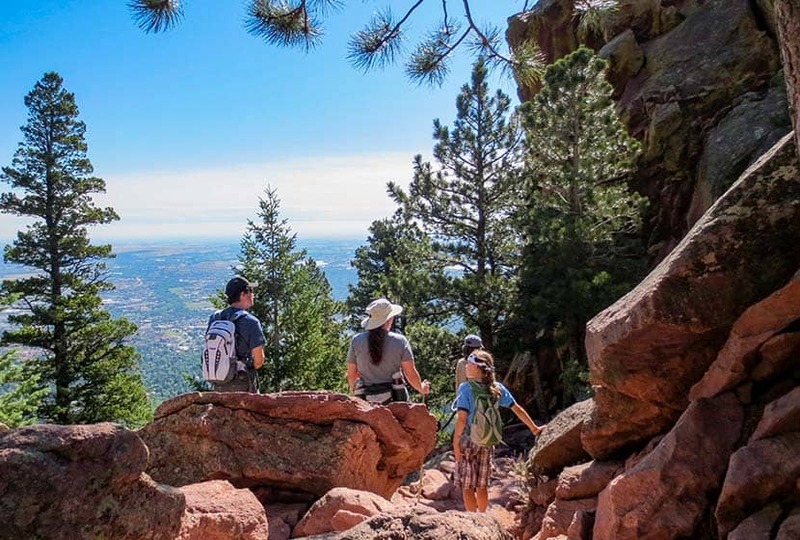 You’ll find the best part of this hike in the Flatirons at the end of the trail: some breathtaking and unmatched views of Colorado’s Rocky Mountains. There’s even more though. 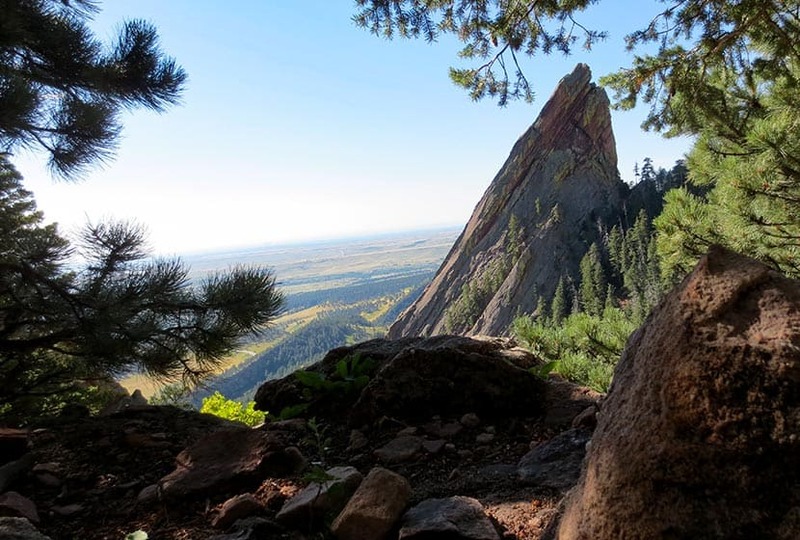 Explore the trail profile below to get links to the Flatirons map, hiking tips, trail details, and driving directions to the Chautauqua Park trailhead. The Flatirons are the most prominent feature of Boulder Colorado’s landscape. They are beautiful to take in from a distance, but they are even better to explore. 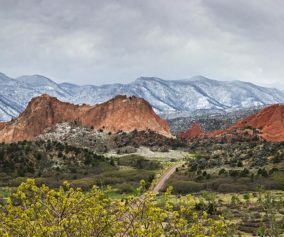 Here I’ll give you a three different options on how to make the most of the First and Second Flatiron trail, and some details on what to expect. In the panorama video above, you’ll see that the first flatiron is the most prominent. It’s on the far right (North) and the second and third flatirons follow it to the south. There is an impressive canyon between the second and third flatirons that you’ll get to peer down into towards the end of the trail. But let’s start this hike profile at the trailhead. 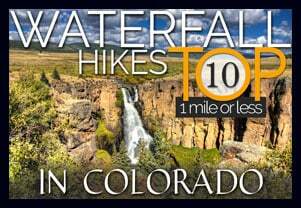 1 – Chautauqua Trailhead: You can start your hike from a couple different places. I chose Boulder’s Chautauqua Park trailhead. The parking lot will fill up fast, by 8:30 on the weekend, but you can park along Baseline Road. The city of Boulder is doing some improvements on the parking area beginning September 3rd, 2013 and it looks like the lot will be closed. Here’s a link for construction updates. But don’t let that deter you, just park out on Baseline. 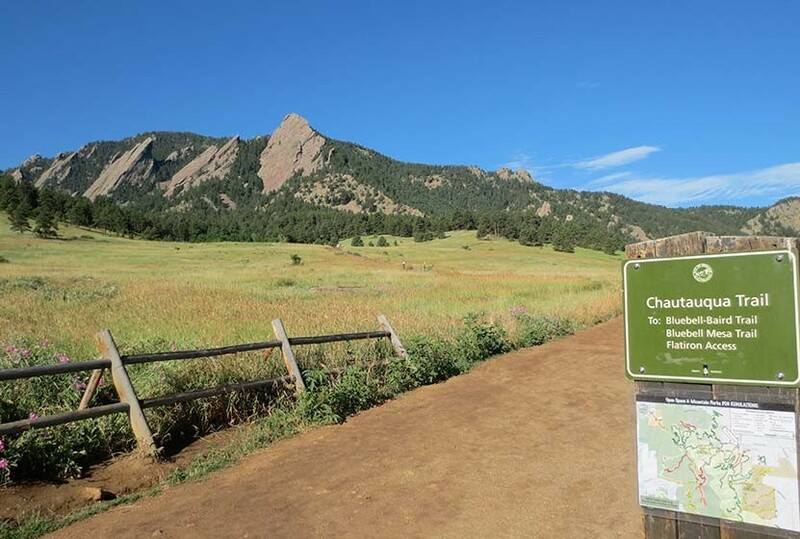 The Chautauqua trailhead features an historic Ranger Cottage (link for hours of operation), and you’ll find free trail maps for the flatirons in a box attached to the sign at the entrance to meadow. 2 – Enchanted Mesa Trailhead: This is a lesser known trailhead (but probably well known by locals). Here’s a google map to help you find it. 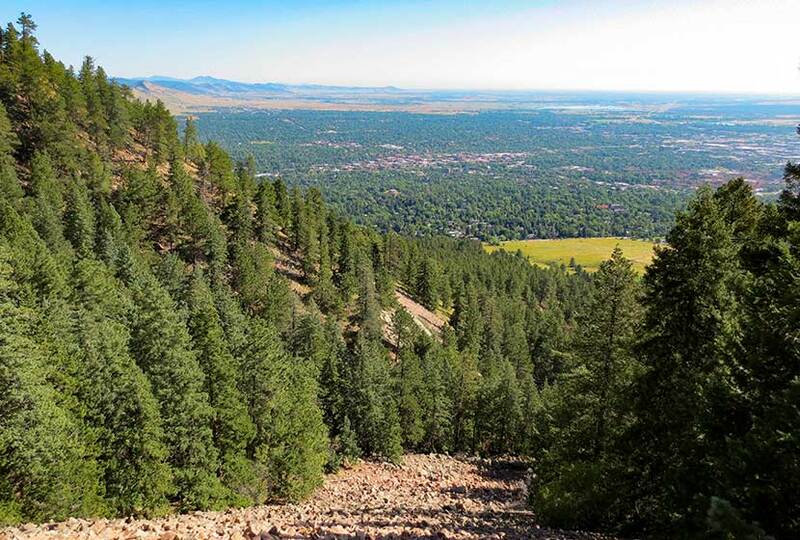 From here, you can walk across to Chautauqua Park and pick up the Chatauqua Trail, or you can make a longer trip out of it by following the McClintock Upper Trail in. 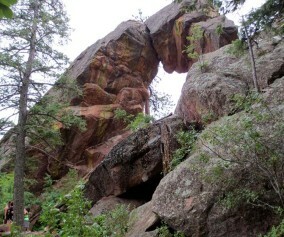 See the Chautauqua Area Hiking Map for details. Here’s the basic set of trails I’d recommend just because it’s the most direct approach: Chautauqua Trail to First and Second Flatiron Trail. On the way back, I’d recommend the Bluebird Mesa trail; it takes you through a pine glade along the spine of a Bluebird Mesa, then gently drops back down to the Chautauqua trail near the trailhead. This makes for a roughly 2.5 mile hike. Make it a loop. 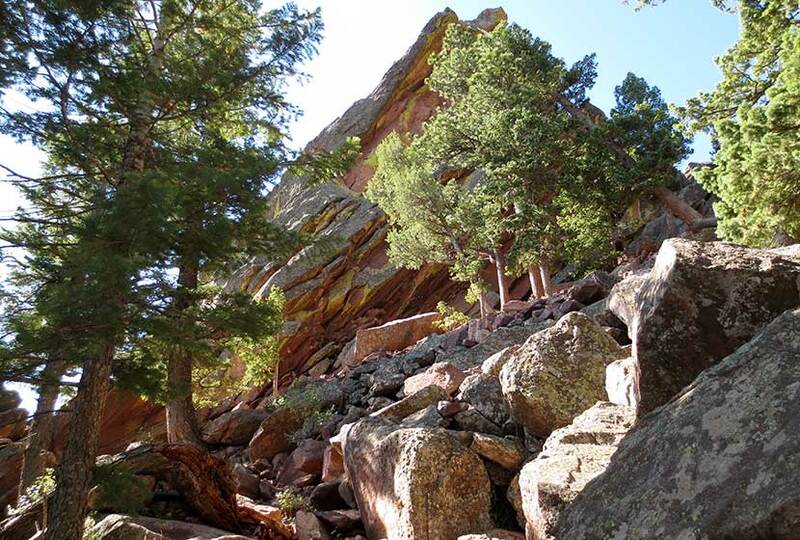 Deb Stanley details an interesting loop by taking a little known trail down the back side of the flatirons that hooks back into the Saddle Rock Trail. Looks like fun, but it also looks like it could be easy to get turned around in there if you’re not careful. 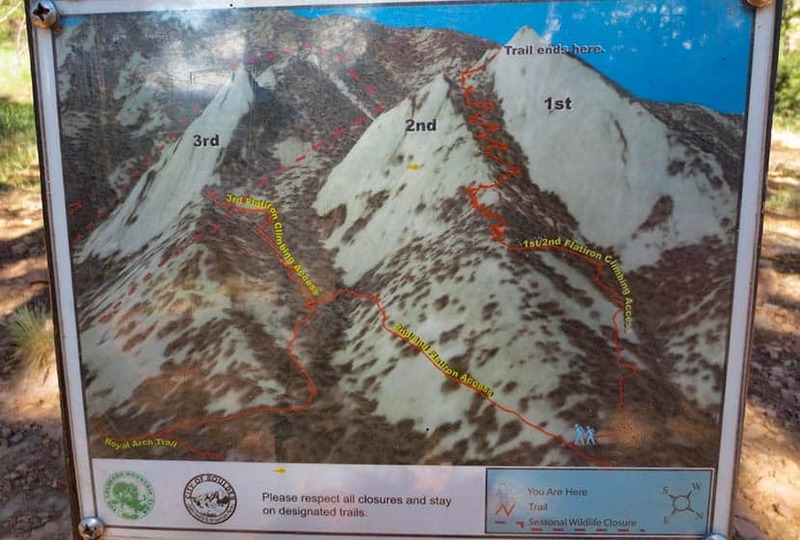 Check out the details on her loop trail profile if you’re interested in taking this route. This photo gives you the best overview of the Flatirons one and two trail. Basically, once you break out of the meadow and start on the 1st and 2nd Flatirons trail, your going to ride the ridge of the 2nd flatiron up to a notch between the 1st and 2nd Flatirons. The trail continues behind the flatirons, then bends north and takes you up into a canopy formed by the back of the first flatiron. 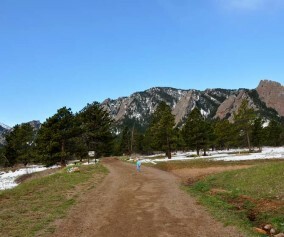 Starting at the Chautauqua Trail, you’ll hike through the spectacular meadows at the base of the flatirons. If it’s after a rain, be prepared for a lot of rain along what is essentially a fire road. The sides of the trail here have a good bit of poison ivy that tries to reach out and touch your calves, so keep an eye out for it. What I found most interesting about this section of the trail was the diversity of both plants and trees along the trail. 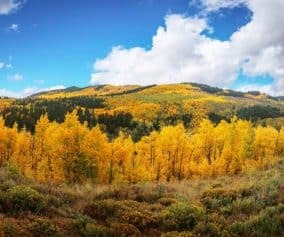 There is a greater variety of deciduous trees and shrubs that I’ve seen anywhere on the front range. After taking the Bluebird-Baird Trail (left), you’ll encounter a fork in the trail. 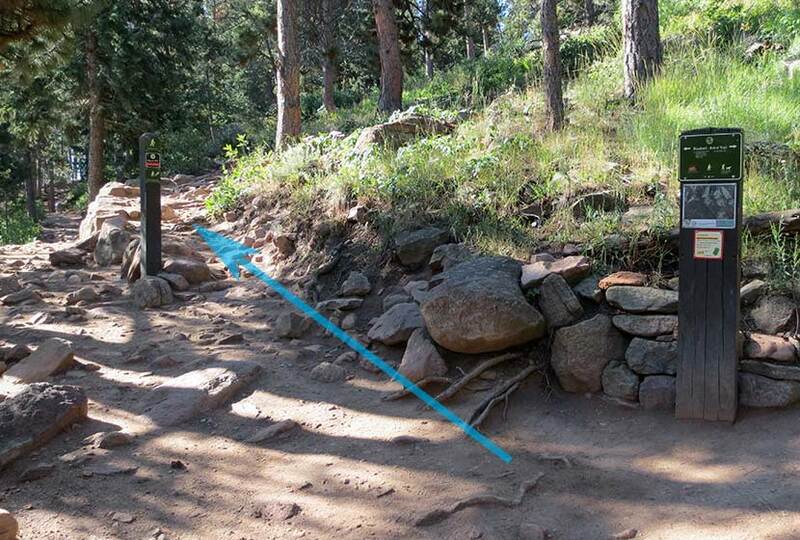 Follow the signage towards the 1st and 2nd Flatirons trail (see photo below). 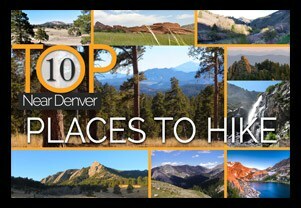 Soon the trail will fork again and you’ll want to take the 1st and 2nd Flatirons trail. The signage is really good in the Chautauqua/Flatirons area. Emerging from the woods, you’ll hike up through a long talus field, but the trail is well-constructed through this gigantic pile of rock. Be sure to look back at the views that open to Boulder. The trail goes in and out of the shade, over a lot of rock, and eventually to a short scramble over some larger rock to regain the trail. The next landmark you’ll reach is the notch between the first and second flatiron; you’ll see the angled outcrop of the second flatiron just below the notch (photo below). This is a great place to stop and relax. The notch between the first and second flatiron offers more views of Boulder and a birds-eye view of the CU campus, it’s terracotta roofs against the green of the city lawns. But the better place to take a break is just behind the notch. Here, you’ll be able to look down into canyon that runs between flatiron two and three, and you get a great view of the imposing profile of flatiron three. Then take the trail up a few switchbacks as it bends north. You’ll hit a saddle but the trail will continue to bend to the right, until you find yourself in the shade of the massive top of the first flatiron. 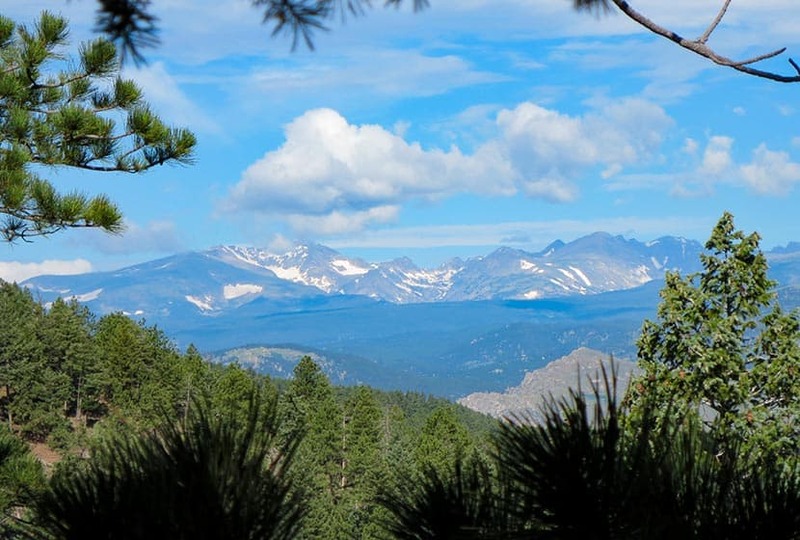 Back here you’ll find all kinds of rock shelves and nooks to sit and take in some of fantastic views of Colorado’s Rocky Mountains to the West. TIP: This hike gets really crowded, so start early (before 8:30 AM). TIP: Take a lunch or breakfast and coffee with you. The first flatiron nooks are perfect for just sitting and enjoying a picnic. TIP: Weather can come up fast on the flatirons in the summer. Just be aware that it can change fast and bring a rain jacket. TIP: Dogs are allowed if they are leashed. Boulder does have a special tag you can get for your dog to allow it off leash in the park. It’s called the Voice and Sight Control tag and you can get more information here. With the flooding, there are a lot of trails still closed in the Boulder area. Here’s a link to the a listing and Map of the trails that are open. Looks like the Flatiron hike is open. Exercise greater caution as you hike in rocky areas as the flooding has loosened up a lot to ground. this area has alot of flood damage but is still very pretty! Get there early, parking can be pain on the weekends. 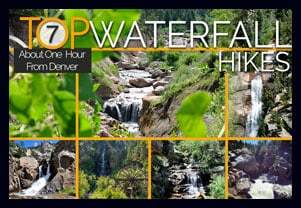 Great hikes for all abilities. Do not forget your camera as you will have some get picture to take. Enjoy this in the summer to stay cool. The 1st Flatiron was my first big climb in Colorado. Beautiful approach, trail turning into rocky ground, then woods. Your hike ends at the base of the mountain, it’s slabby, small toes and crimps, shifting your body as you go. I completed 2 pitches. What a beautiful view. I will go back and finish sometime soon. Thanks so much for this info! I was having a hard time figuring out where to pick up a trail to hike the Flatirons. This helps a lot! I did the Chatauqua Trail on May22. Got to the parking lot at 6:45 and the parking lot was almost full. Great hike. Are the trek closed on Thurday and Firday? I’m not sure what you are asking? Could you be more specific? Just wanted to warn everyone to take your credit cards, debit cards, passports with you if you park at a trailhead. I had my debit card and credit cards and my daughter had her passport stolen out of our locked car and the thieves made over $6000 in purchases before we knew the cards were missing. They broke into our locked car, stole the cards/passport, then put everything back and then locked the car so we wouldn’t notice anything. They then went to the nearest town and used the cards. We noticed a couple sitting on a tailgate eating when we parked there. Please be careful and don’t leave these items in the car. It has been a nightmare and we don’t want this to happen to anyone else. It happened on Christmas Eve.